Al Jazeera English for Windows Phone 8 brings you all the latest news and live broadcast of Al Jazeera English, free of charge. The 24-hour news and current affairs channel is the first international English-language news channel to broadcast across the globe from the Middle East. Al Jazeera's global footprint continues to grow and now broadcasts to more than 260 million households on six continents in more than 100 countries. 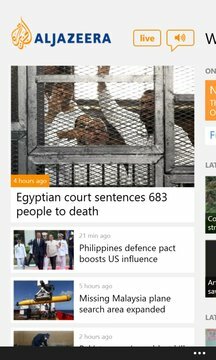 Note: This app features content from Al Jazeera English.